Wind turbine control system KONČAR KONwecs is a state of the art solution for control of wind generators with an MW power output. It ensures safe and reliable system operation and optimization of energy production in all weather conditions. The operation can be particularly demanding and critical due to strong winds when wind power plants use blade rotation along its longitudinal axis for power regulation. 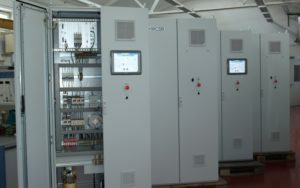 The system was developed in KONČAR – Electrical Engineering Institute on a proprietary platform which was used to develop several generations of digital voltage regulators, converter devices and control systems for locomotives, low-floor trams, and trains. The system is flexible and expandable and can be easily adjusted for specific requirements. KONwecs can, therefore, be a great replacement solution for modernization of the control systems of the wind generators already in operation.